“There are two books I think everyone in the West should be familiar with – The Bible and The Odyssey.” So said to me the classicist turned kindly village vicar many years ago on a chill winter’s afternoon. I confess I haven’t quite yet managed to get through the former but, prompted by his remark, I did borrow his yellowing paperback copy of E.V. Rieu’s classic prose translation of The Odyssey and was at once swept away by the storms, seductions and fights (fewer than the Good Book, though with a larger roster of deities.) What struck me most perhaps, was how strangely familiar it all seemed. As with our own Chaucer and Shakespeare and Dickens, the classics are so sunk in our culture (despite popular evidence to the contrary) that they are part of the fabric whether we are conscious of the fact or no. So it was with some anticipation that I went along to see Paper Cinema’s interpretation of this cornerstone of the Western canon. Actually “see” is inaccurate. The whole thing is very much a cross-sensory experience, as pretentious as that sounds. I didn’t know that then but I did have the feeling that I was going to witness something pretty special. I wasn’t to be disappointed. Housed in the faded fin de siècle grandeur of the Battersea Arts Centre with its tessellated floors and muraled ceilings, The Odyssey unfolds in a rectangular room on the first floor. The auditorium was warm when I entered (too warm, I realised, and I had visions of falling into a beer-induced slumber) and as the doors open at right angles to the stage, you have no idea what everyone is looking at until you have found yourself a seat. The place was packed with a palpable air of expectation and I secreted myself away on one of the few remaining seats, on the end of a row at the far left of stage. At the front a large white screen hung from the ceiling embraced by a horseshoe of low tables on which sat a variety of objects including stacks of paper, pens, ink pots, angle-poise lamps and two small digital cameras on tripods pointing at a couple of curious black discs supported vertically. The effect was part O-Level science experiment and part art school improv and was pleasingly Heath Robinson. Old school analogue, you might say. Next, in came the performers – musicians Christopher Reed, Ed Dowie and Quinta, puppeteer Irena Stratieva and artistic director, illustrator and all-round Prospero to the troupe, Nicholas Rawling, resplendent in a fine thatch of facial foliage. The musicians gathered to the right of the horseshoe, the puppeteer and Rawling to the left, nearest me. He stood in front of a high stand-alone table – the others sat – and, like a conductor on the threshold of a pit, began. But what exactly was he doing? Black marks began to appear on the screen which now clearly was lit up. The marks grew and changed in relation to the movement of Rawling’s hand, and then it struck me – he was sketching live with a dip pen directly onto paper supported on a sort of light box! He worked fast, with the confident flourish of a maestro but it was a few more moments before a likeness presented itself. Of course! It was a portrait of wily Odysseus – the hero of the piece – and his good and faithful wife Penelope. Several more followed in a similar bleeding style expanding like Rorschach ink blots, including Anthena, protectress to the hero and Penelope’s rapacious suitors, represented with cunning directness as wolves. Throughout this the musicians plucked, strummed and kneaded the little chamber of musical saws, viola, keys and birdbox guitar in a sound that was part score and part accompanying sound effects. This all amounted to what in effect was the opening credits, as the story proper started with Rawling sitting down with his puppeteer between one of the video cameras and the curious black discs. Working in tandem the two then began to select pre-drawn two-dimensional cut-outs from heaped stacks ordered presumably by scenes. By layering two or three drawings simultaneously the illusion of perspective could be given. By moving a particular drawing through space (a boar, for instance, followed by an arrow to evoke a hunt) and by flicking a background image of trees and bushes swiftly behind it, a very believable sense of movement was achieved. This was all picked up by the video camera (the black disc providing a matt background) and projected live onto the screen. At times it was difficult to know who to watch – the creators or the creation – and although this was occasionally distracting, it was also part and parcel of the whole wonderfully idiosyncratic experience (a bit like having the chef de cuisine whipping up a feast at your own restaurant table). It was all very much proof that it was ‘live’, that the mechanics were on display and in a sense the audience was invited to take part in the process. The story was divided into three parts with accompanying chapter titles, each running to roughly 20 minutes. A knowledge of the text was in some ways a disadvantage – I often found myself looking out for scenes that had been jettisoned but in fact I was so rusty that I had forgotten that the story opened with Telemachus, Odysseus’ son, setting out for the court of King Menelaus in Sparta for news of his father – the one bit of the production that irked my purist self as it depicted the boy travelling first by motor launch then by motorbike. But the makers knew what they were about and clearly there was an integrity to the adaptation which was more a re-imagining. The iconic scenes remained in tact and in order: the imprisonment of Odysseus by the sea nymph and sorceress Calypso on her island; the hero’s battle with the Cyclops Polyphemus; his journey to the underworld; and the final destruction of the lupine suitors. Each scene was given some ingenious spin – the jittering of one of the angle-poise lamps to give the effect of lightning during a storm, together with the whining of a saw. The drawings themselves were very different from the ‘Rorschach’ titles. At times they resembled the grotesquery of Peake at full power, at other times they held the simplicity of Hergé’s ligne claire style. Catching, lifting and twirling, the images flowed with the music which reminded me now of the vaudeville oddity of the Bonzo Dog Doo-Dah Band, then the wurlitzer flights of Jon Brion and also the weird refrains of the Delicatessen score. With all the stacks of paper, scores of drawings, weaving hands, plucked strings and glimmering lights, there was endless opportunity for mischance. But somehow it all kept in the air, like magic, fittingly for a tale imbued with the stuff. 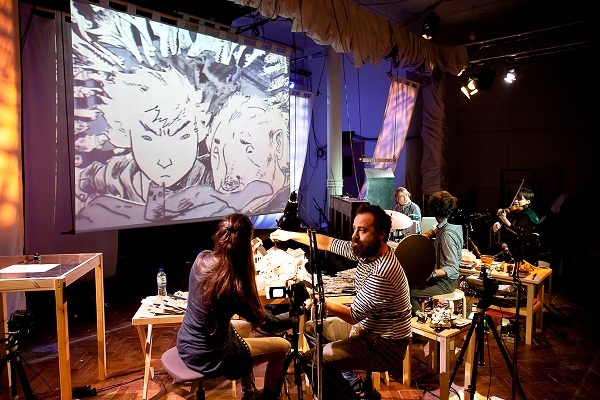 “The Paper Cinema is an illustrated song, a shadow, a smoke, a mirror, a puppet show, a cinema show, side show, magic show, a show and tell, a show off. 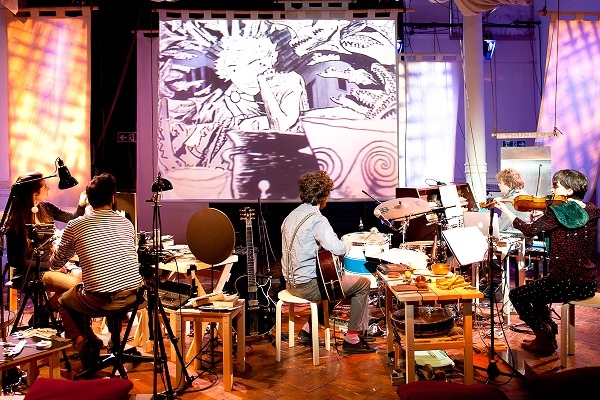 It exists in the meaning of live music and live drawings. I think the old vicar would have approved. 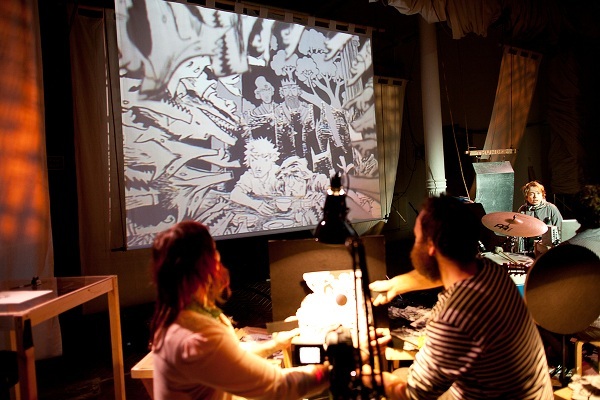 The Paper Cinema’s Odyssey runs until February 25th at the Battersea Arts Centre, Lavender Hill, London, SW11 5TN. Box Office Tel. 020 7223 2223. Website.